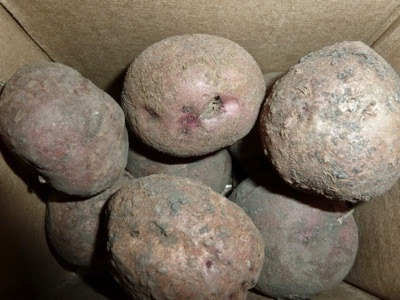 My Home and Garden: Is there anything better than unexpectedly receiving seed potatoes in the mail?! 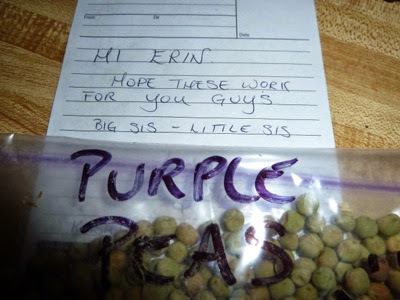 Is there anything better than unexpectedly receiving seed potatoes in the mail?! I'll answer that...NO!! NO THERE ISN'T. 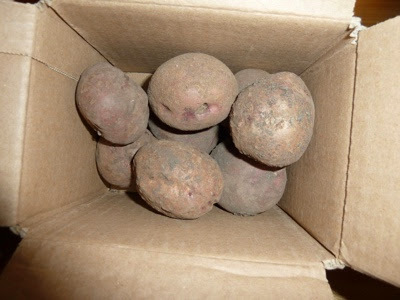 My brother Steven, who is as garden obsessed as I am, sent me an unexpected box of seed potatoes. They aren't just any old potato. Apparantly they taste exactly like the ones my grandparents grew. They were so delicious. These could very well be the same variety. Does anyone know what they are? They decend from three originals that Steven's partner Trish was given while in Quebec. In the box were some extra little treats. Including these purple flowered peas. Aren't I lucky!! I am hoping that I have enough potatoes at the end of next year to keep me going after that. I have four types. My brothers, a purple from a friend up island, a pale yellow with a blush of pink of them and my compassion farm potatoes. I think they may be Yukon Gold but I'm not really sure. Potatoes are one of my favourite foods. You are lucky. Big potato lover here too! Me too! I literally could live on hot potatoes with butter and salt.